Lead prices on the LME have risen 9.5 per cent since March, led by a slowdown in mine production and a relatively higher demand. Lead is used largely in car batteries. About 80 per cent of the metal is used in the lead acid batteries used in vehicles. According to data from Bloomberg, the number of lead-acid batteries in newly assembled passenger and light vehicles is projected to go up 4.8 per cent in 2014 to 86.82 million. The pick-up in the global automobile sector is a big plus for the lead market. In the domestic market too, lead futures on MCX have been moving up. Traders who have a medium-term outlook can go long on the contract. Demand for refined lead, which was up just 0.4 per cent in 2012, surged 7 per cent in 2013 to 11.22 million tonnes. This year, the International Lead and Zinc Study Group (ILZSG) forecasts demand to increase over 4 per cent to 11.73 million tonnes. China, the world’s largest consumer of lead, is expected to show a large appetite for the metal. Though the country’s lead consumption in the first four months of this year (January-April) is down 10 per cent, ILZSG forecasts it to rise 7.4 per cent for the full year. Supply, however, is going to be tight. The global output of lead from mines is expected to rise by just 5 per cent in 2014 after a 7.6 per cent increase in 2013, says the ILZSG, widening the deficit in the market. 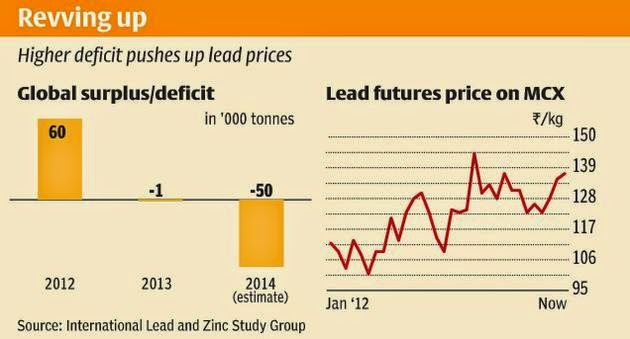 From a 1,000-tonne shortage in 2013, deficit in lead in the first four months of this year has widened to 12,000 tonnes. The ILZSG estimates the shortage to widen to 50,000 tonnes in 2014. Increasing deficit will help lead prices crawl up. India relies largely on imports to meet its domestic lead demand. Data from the Ministry of Commerce show that after two consecutive years of a fall in imports from 2010-11, lead imports surged 25 per cent in 2012-13 and 2 per cent in 2013-14. A weak rupee could keep domestic lead prices higher this year with the metal’s futures price broadly tracking international prices. Medium-term view: The medium-term outlook for the MCX-lead (₹137 per kg) futures contract is bullish. The strong downtrend that was in place since August 2013 reversed last month. Also, as this reversal has happened after forming a double bottom pattern between March and June this year, the chart looks very bullish now. The neckline support of this pattern is at ₹130. The bullish outlook will remain intact as long as the contract trades above this level. Intermediate dips to this support level may attract fresh buying interest. So traders with a medium-term perspective can go long on the contract at current levels. More long positions can be accumulated at ₹135 and ₹132 if an intermediate pullback is seen. Stop-loss can be kept at ₹127 for a target of ₹150. The medium-term outlook will turn bearish only if the contract falls decisively below ₹120. The ensuing target on such a break will be ₹115. 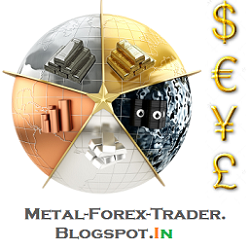 Short-term view: MCX lead is in a strong uptrend in the short-term perspective as well. The contract has consolidated in the form of a triangle in the last week of July and has witnessed a bullish breakout last week. Immediate support for the contract is at ₹136. The 21-day moving average at ₹134 is a key short-term support for the contract. Above this level, a rally to ₹145 looks likely in the short term. The outlook will turn negative only if the contract records a strong close below the 21-day moving average level. The targets on such a break will be ₹130.